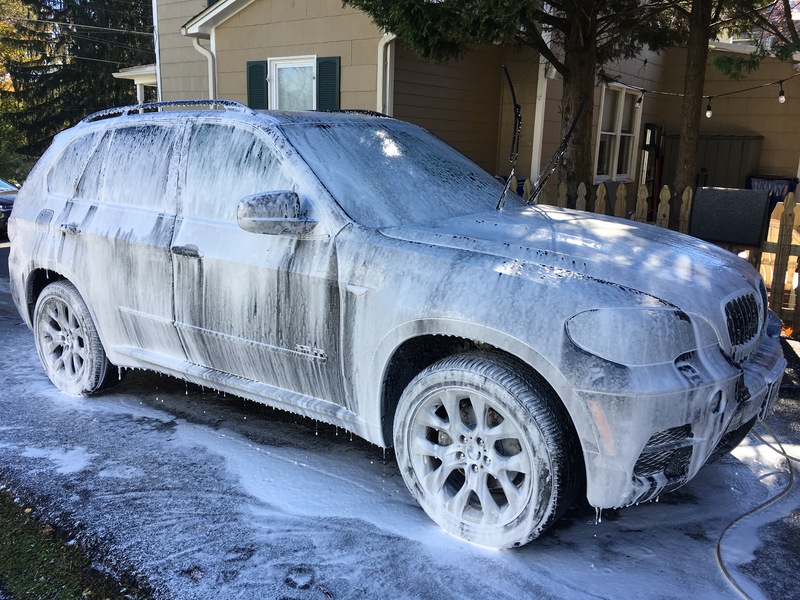 Taking advantage of the unusually warm weather over the holidays to take on some of the paint defects on the X5. 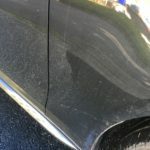 This post shows how to tackle a deep scratch and bad touch-up paint job. When we got the 2013 X5 in 2017, the dealer had attempted to hide a deep scratch with a thick coat of touch-up paint. 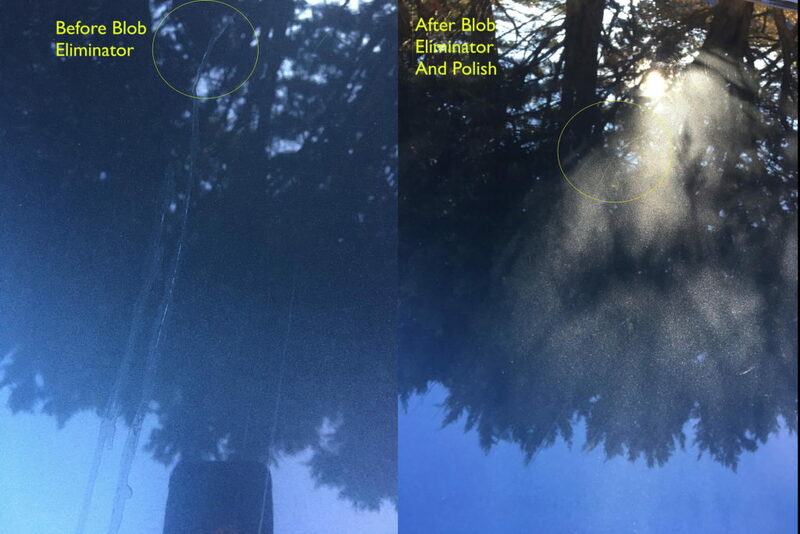 We used Blob Eliminator to safely remove the touch-up paint first, then compounded and polished the hood to see what we had to work with. 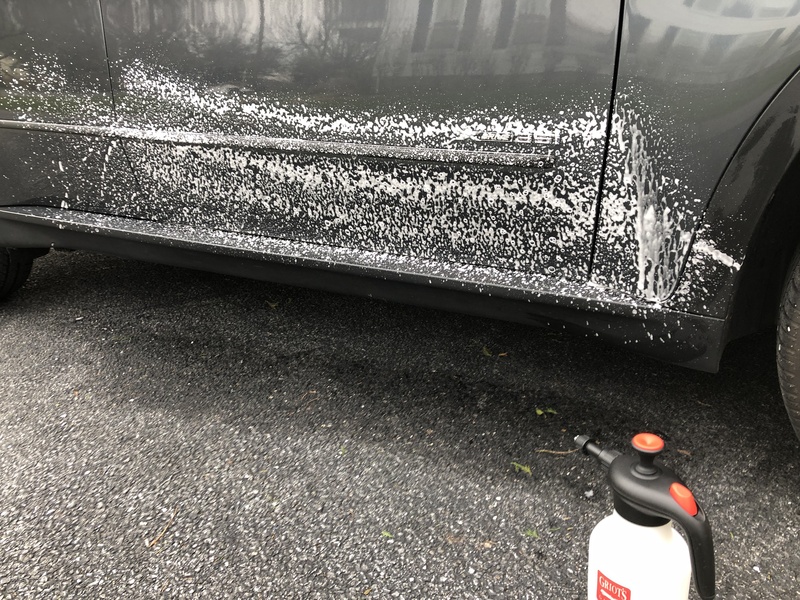 A good tip when trying to figure out whether a scratch is just through the clear-coat or goes into the paint layer, is to spray some water and see if the scratch disappears. If it does, then it’s in the clear-coat. 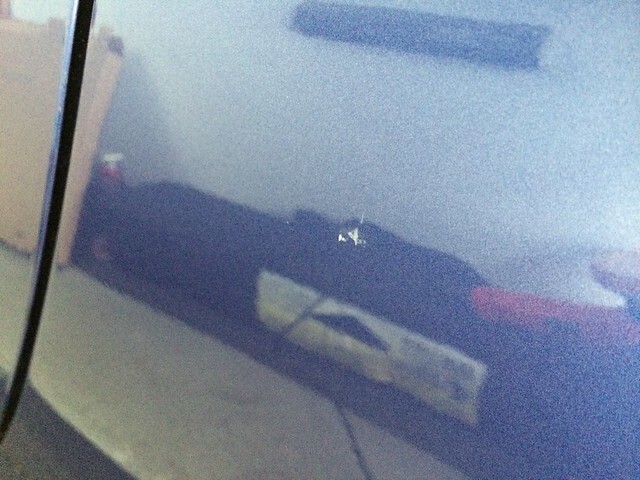 These scratches appear to just be in the clear-coat. Since we’re using this hood for our long-term Bead Maker test, I wanted to see if I could completely eliminate the scratch before sealing the paint. This video shows that process. There is an amazing variety of coating and sealants available today with prices ranging from tens to thousands of dollars. A professionally applied ceramic coating is a thing of wonder. But what about the DIYer? 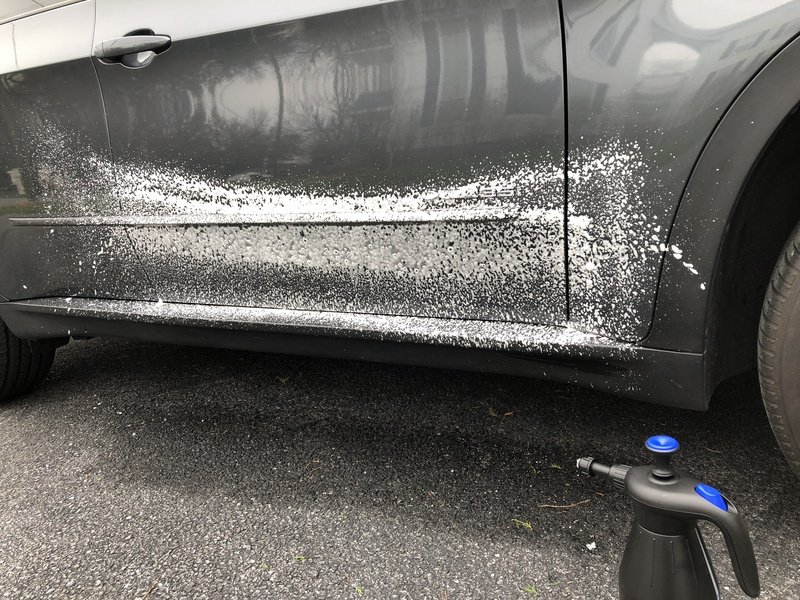 I’m going to stay away from the DIY ceramic coating for the moment (too many horror stories about water spots), and take a look at a couple of popular polymer coatings which promise 3-6 months of protection, starting with P&S Bead Maker. I’m slowly getting ready for winter — not like I really have a say whether it comes or not. Winter wheels are out of the basement and on the car. The hose-mobile is in their place. The faucets are covered. 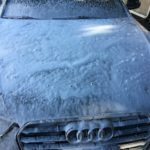 So it’s time to figure out how to keep the cars clean(ish?) without running water. 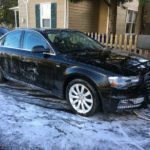 On the back of my recent success with a low-cost power wash foam cannon, I thought I’d try my hand with rinse less car wash. The best wash on the market is the Ammo Frothe. There’s really nothing else like Frothe on the market. It’s $35 a 16 oz bottle, but since it’s concentrated and used diluted 1:20 with water, that works out to only about a dollar a wash. You spray it on and wipe it off. You’ll need to use many microfiber towels in the process. Working one panel at a time, spray it on, then using a folded towel, scoop off the foam. Fold to a clean side of the towel and remove any remaking Frothe. Anything left in the panel gaps will evaporate away. Frothe provides lubrication so as long as you’re working a clean area of the towel, you won’t scratch your paint. 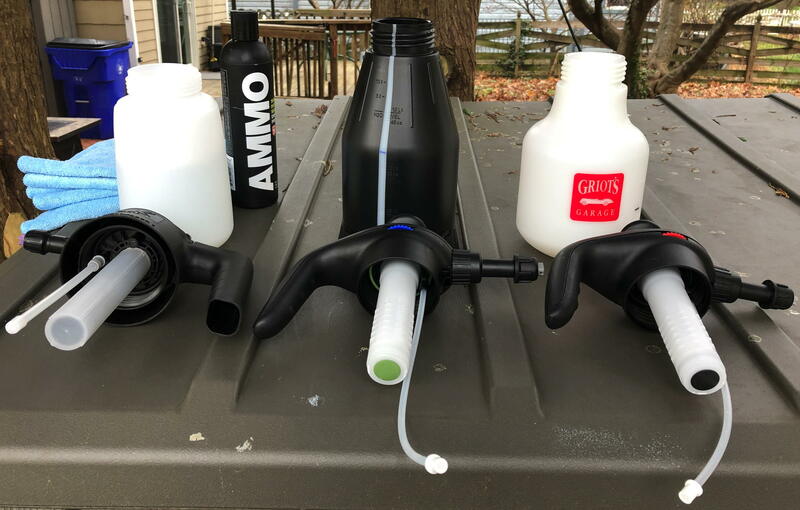 I’m going to compare two different sprayers to the Ammo aerator (in the middle) which is about $60: The Griot’s Garage Pump-Up Foamer (on the right) which retails for about $40; and the IK 1.5 Foam Sprayer (on the left) which retails for about $33. The Ammo aerator is made in Italy for Foam-iT. Ammonyc currently is the sole automotive reseller in the US, but that may change in early 2019. If you take a look at the internals of the Griot’s and Ammo sprayers, they look like they’re from the same manufacturer. Just the bottles and color accents are different. I used Ammo Frothe for the functional comparison, mixed 1:20 with water in all three sprayers. Each sprayer was pumped to full pressure (hard to pump for Ammo and Griot’s; pressure relief opened for iK) and I made a single pass left-right on the same panel, wiping the Frothe clean with a microfiber towel between each application. Ammo Aerator: The first thing you’ll notice is how well it’s made. It just feels substantial. It has a wide base so it won’t tip over. There’s an easy-to-read clear window down the side to you can tell how much liquid is inside. It was the easiest of the three to pump and seemed to take fewer pumps to get to full pressure. The trigger action is different from the other two: It doesn’t engage until the trigger is fully depressed which took a little while to get used to. It produces thick foam, but it was not as even as the iK sprayer. Griot’s Foamer: Despite the similarities of the components with the Ammo unit, it takes a significantly greater effort to pump it up to pressure. It also doesn’t stay pressurized as long, so you will be pumping more often. 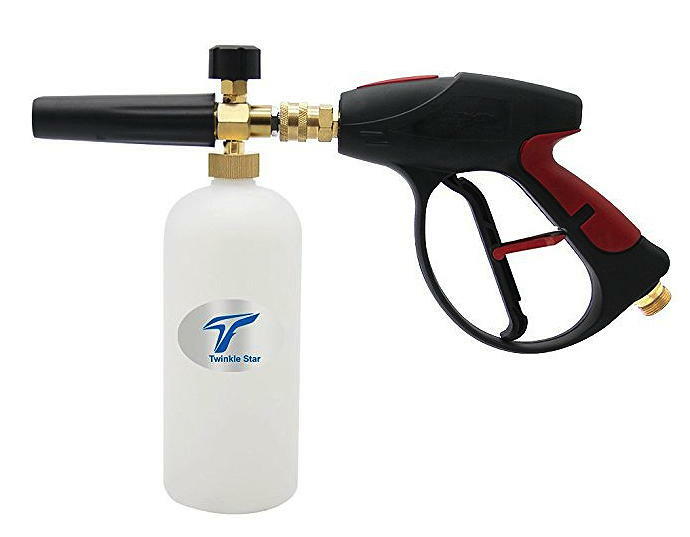 The trigger is smoother, so you feel like you have a little more control over the spray. 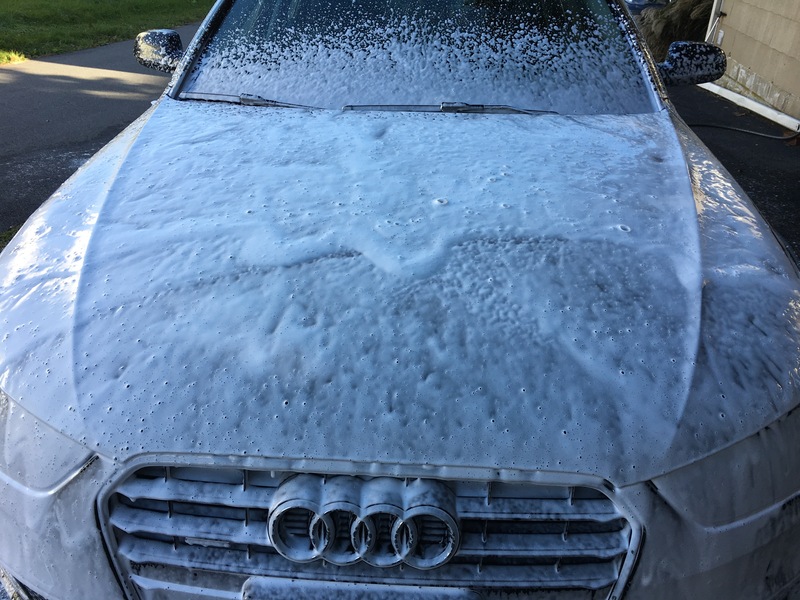 The foam was not as thick or as even as the other two. You would need to make twice as many passes with this sprayer to get the same coverage, at least with the Frothe product. 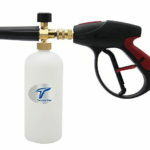 iK 1.5 Sprayer: This sprayer was our favorite of the three. 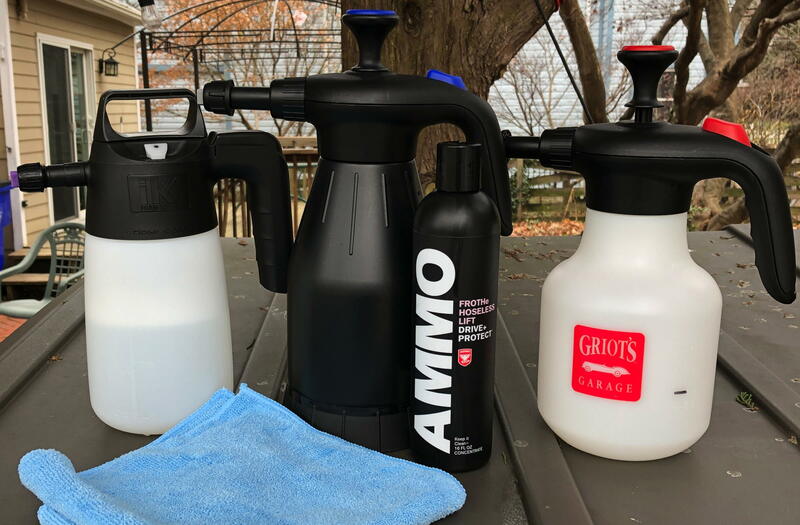 It took about the same effort to pump to pressure as the Ammo sprayer, though with the smaller volume bottle, you may have to refill more often depending on the job. We liked the trigger action and the check-valve. 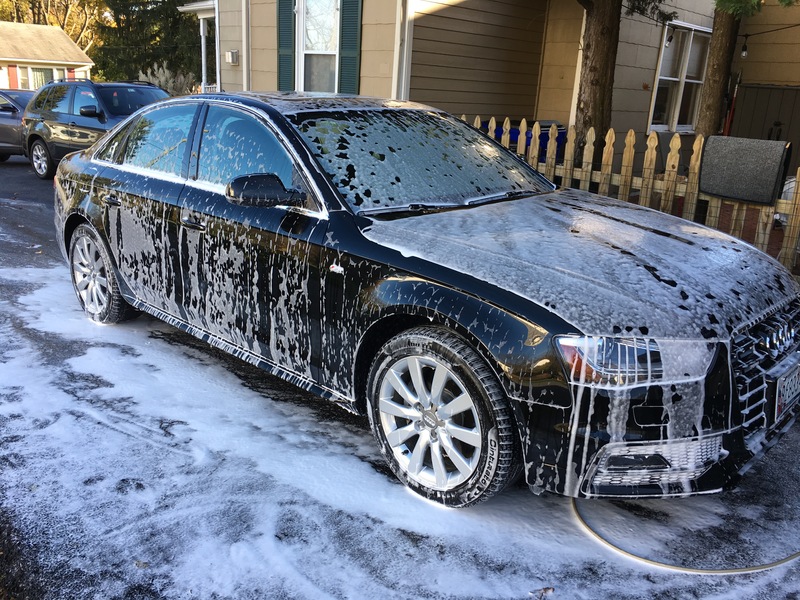 It also has several adapters so you can dial-in the type of foam you desire — drier like shaving cream, or wet like a foam cannon. We found the green adapter worked best with Frothe and provided more even coverage than even the Ammo sprayer. It is the least expensive of the three but also has an extensive list of available spare parts. It has a pressure relief valve. You pump the sprayer until the pressure releases and you have the same starting pressure every time. That takes some of the guess-work out of using the sprayer. 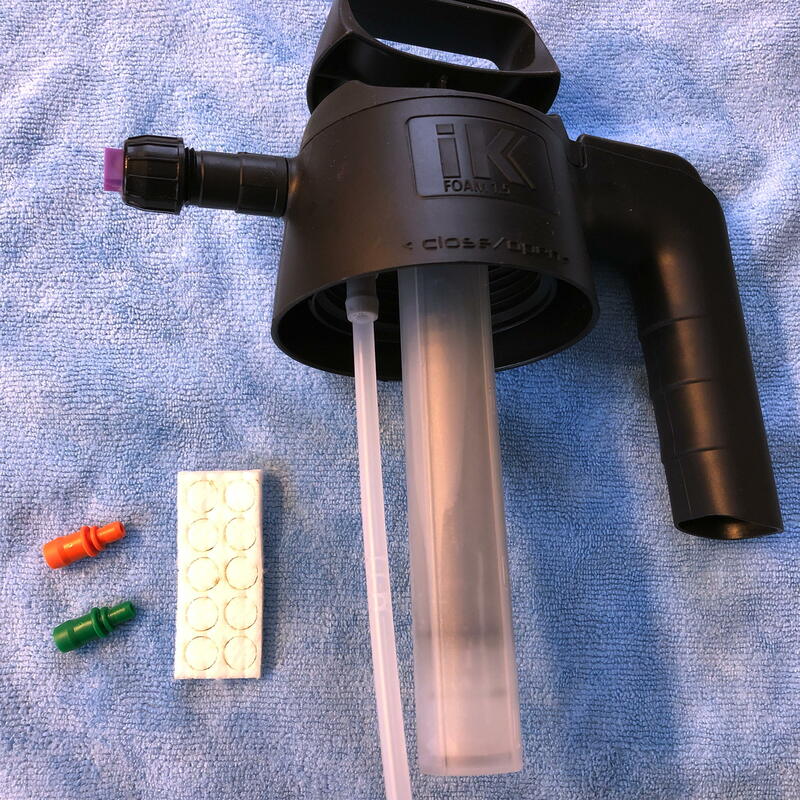 It comes with spare filters and has three different color-coded mixer adapters: ORANGE to create very wet foam, GREEN to create very dry foam and GREY that creates standard foam. We used the green adapter for this comparison. The bottle is smaller. In fact, the usable volume is about half of the others. Depending on your application, that’s either good or bad. If that volume is enough to get the job done, then it’s potentially lighter to use and takes less effort to pressurize. If you have to re-fill, then it could slow down your work. So what’s the bottom line? All things being equal, our favorite is the iK Sprayer. It gets the job done with less work and is good value for money. But you can’t really go wrong with any of them. If you know you’ll be doing bigger jobs, then get the Ammo aerator. If you want a compromise between cost and volume, then get the Griot’s sprayer. I’ve always purchased the bag of micro fiber towels at Costco, but got to thinking there had to be a better option out there that wasn’t too expensive. That quest first took me first to Alibaba, where I quickly realized two things: 1. I don’t know enough about micro fiber to make an intelligent buying decision and 2. I don’t belong on Alibaba. If you want to buy a shipping container full of towels, that’s the place to be. To re-stock my shop, not so much. Through Pan, I found many other videos reviewing various cannon, soaps, and pressure washers by other YouTubers. 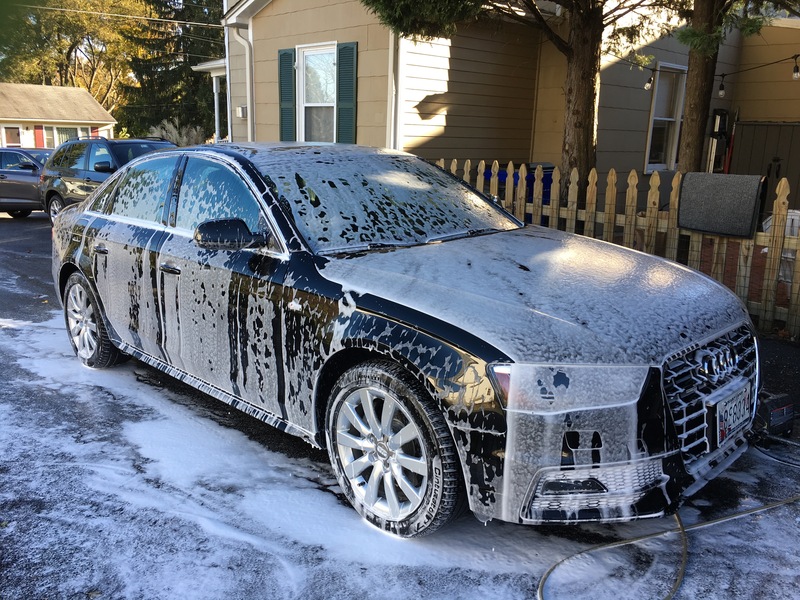 It seemed to me that many of them came to the conclusion that you had to spend a lot of money to get an expensive cannon and pressure washer. So I took that as a challenge: Could I get a good result for little money? My research took me to find the Ryobi 1600 PSI Electric Pressure Washer which is about $100 at Home Depot, and the Twinkle Star Foam Cannon (yes, that’s really the name) on Amazon, which is about $25. Armed with my low-cost rig, thought I’d try three different foaming soap products, representing three different price-points. 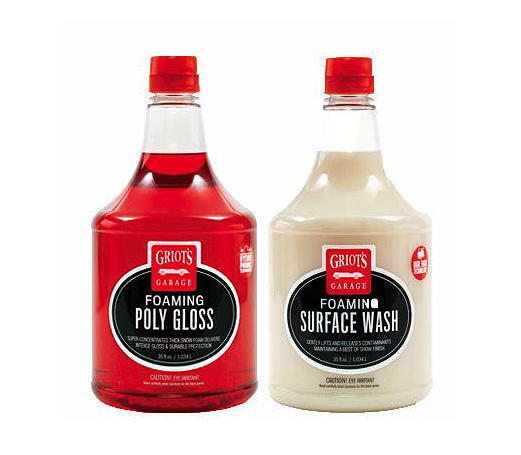 At the high end is the one-two foamy punch of Griots Foaming Surface Wash ($49/gal) and Foaming Poly Gloss ($69/gal). 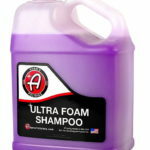 Splitting the two is Adam’s Ultra Foam Shampoo ($59/gal). 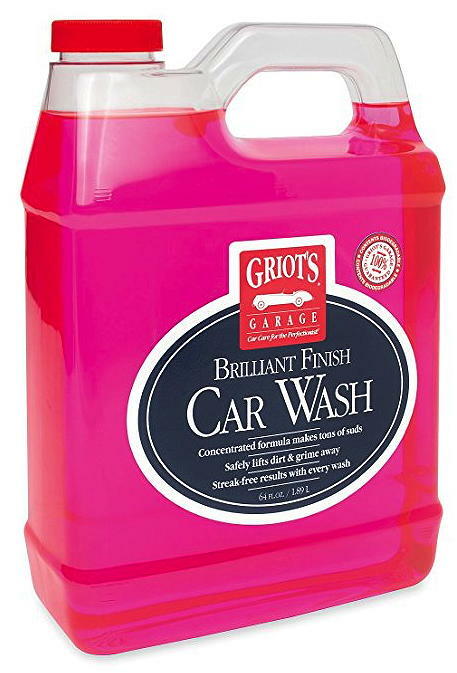 And as a control, I used Griot’s Brilliant Car Wash which I already had in the garage and is about $11/gal. 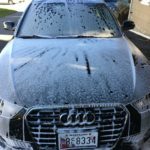 Since I’m washing the same car four times, I’m not going to find out how well the actually clean, but rather how well they foam. 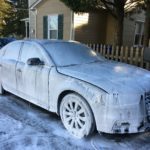 The idea behind foaming soaps is that by dwelling in their foamy goodness, they’ll lift and clean without the need for as much scrubbing which causes most paint defects. 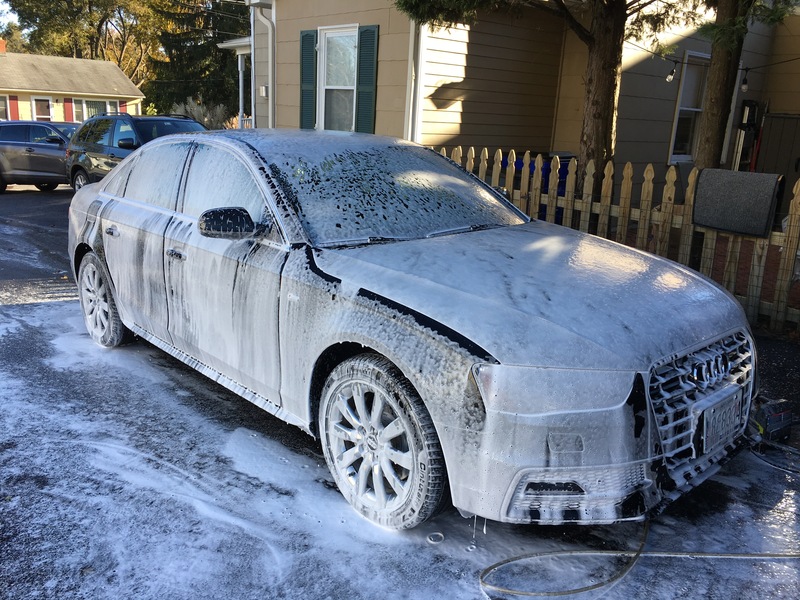 The more foam — the more lifting and lubricating. Or so that’s the sales pitch. Keeping in mind that you’ll also use more product and spend more on soap, you realize the manufacturer’s aren’t entirely altruistic. For each of the soaps I used 2 oz of product mixed with 24 oz of warm water in the cannon. 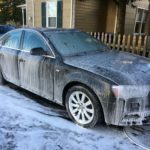 This is about half the recommended amount of soap from the manufacturers, but I figured it might give me a better idea of how each performs for someone trying to stretch their detailing dollar. I played with the two adjustments on the cannon (aperture opening and water volume) to maximize foam thickness for each product. 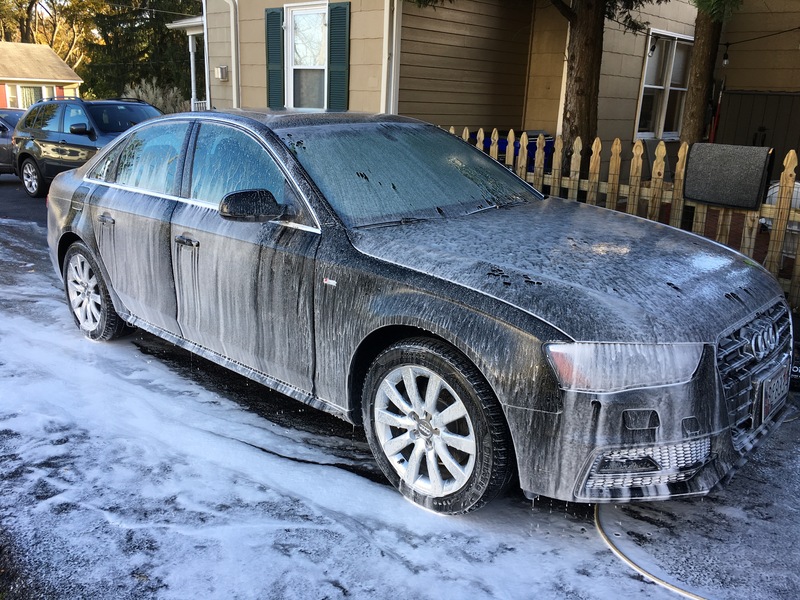 The order of testing was Brilliant Finish Car Wash (control); followed by Adam’s Ultra Foam; then Griot’s Surface wash; and finally Griot’s Poly Gloss. For each, I tried to capture three data points: 1. 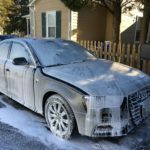 How thick was the foam when first applied? 2. 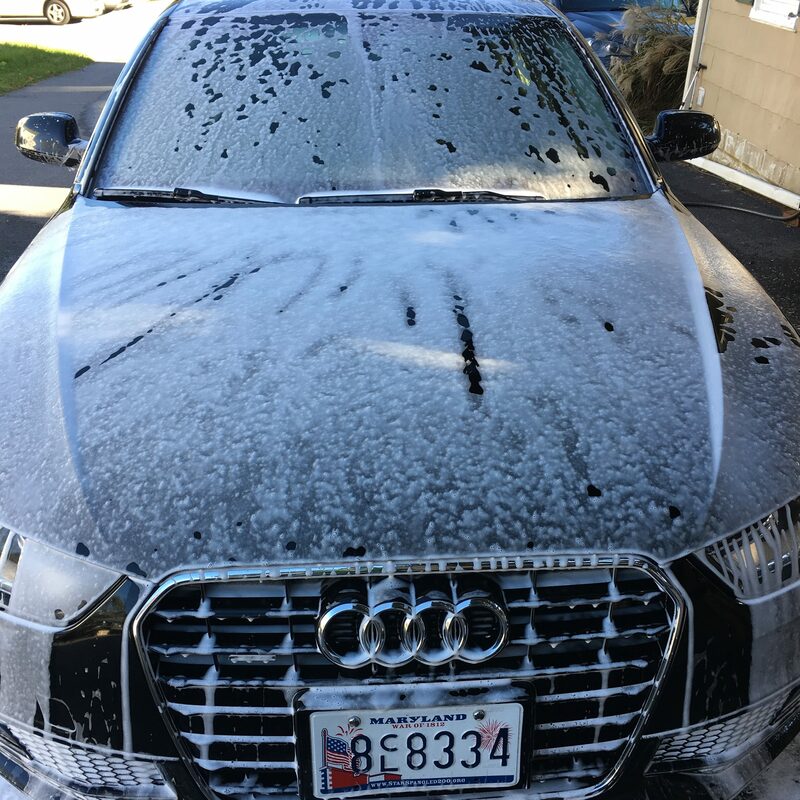 How well did it cover the car once you got it on each surface? 3. 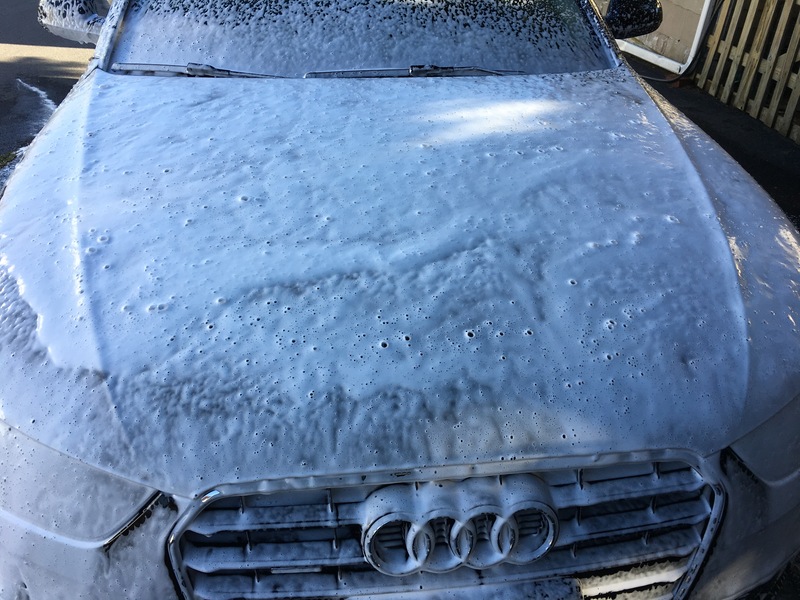 How much remained on the car after 5 minutes of dwell time? That last test probably wasn’t a fair assessment. 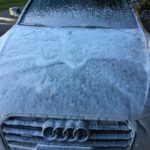 By the fourth wash the car was so clean that I’m surprised any foam stuck to the surface so I may need to re-run that test with it on a dirty car each time. 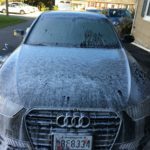 This first photo gives you some idea of how dirty the car was before the first wash.
Here’s the control (Brilliant Finish Car Wash). 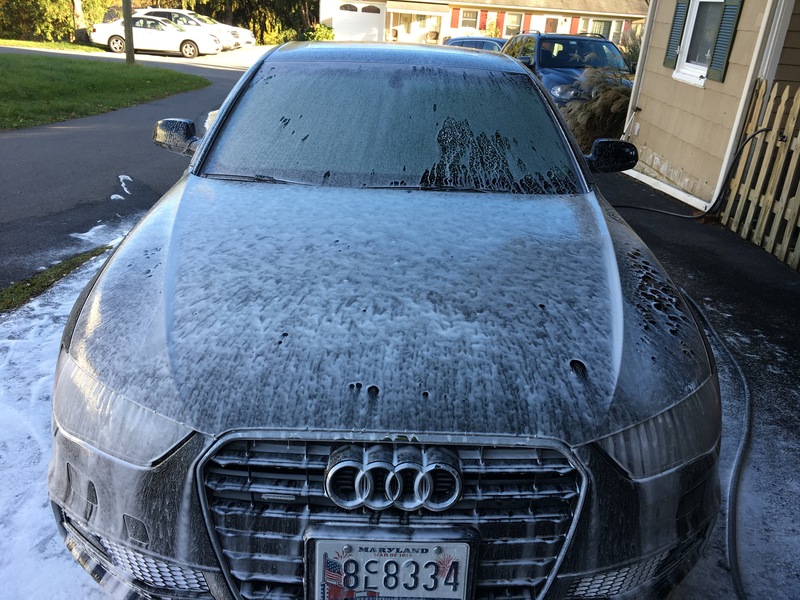 This is normal, not too expensive, concentrated car shampoo. I usually put 2 oz of this stuff in a 5 gal bucket to wash a car. Any foamy soap should be better than this or it isn’t worth the extra cost. It actually foamed better than expected. It provided good coverage, but was fairly dissipated within 5 minutes. 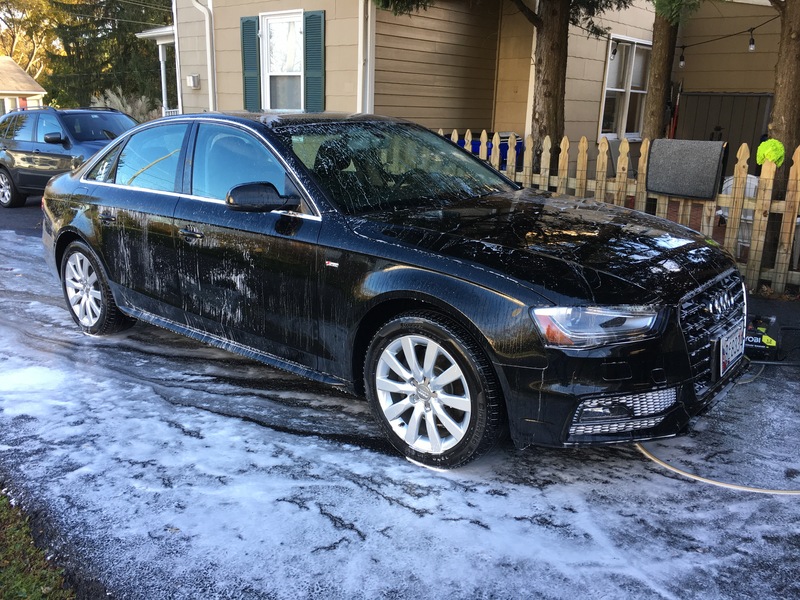 This is probably a good choice for a moderately dirty car that you know you’re going to wash with a wash mitt after this step anyway. 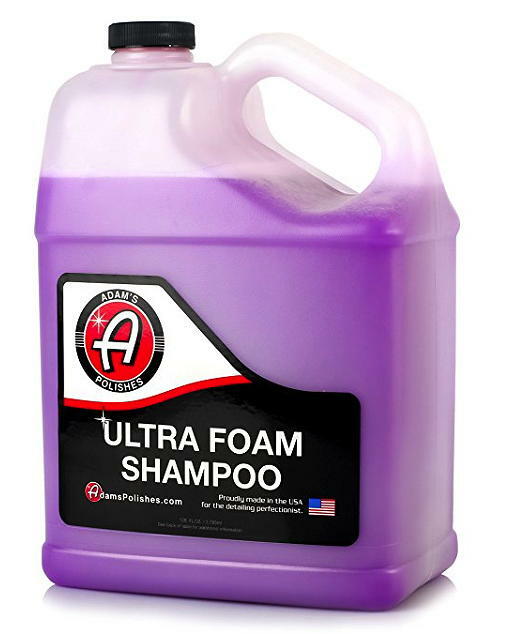 Next up was the Adam’s Ultra Foam Shampoo. I got several sample packets while at SEMA, plus a 20% off coupon (“GETSHINY” good through 11/15/18) so I was eager to try it out. 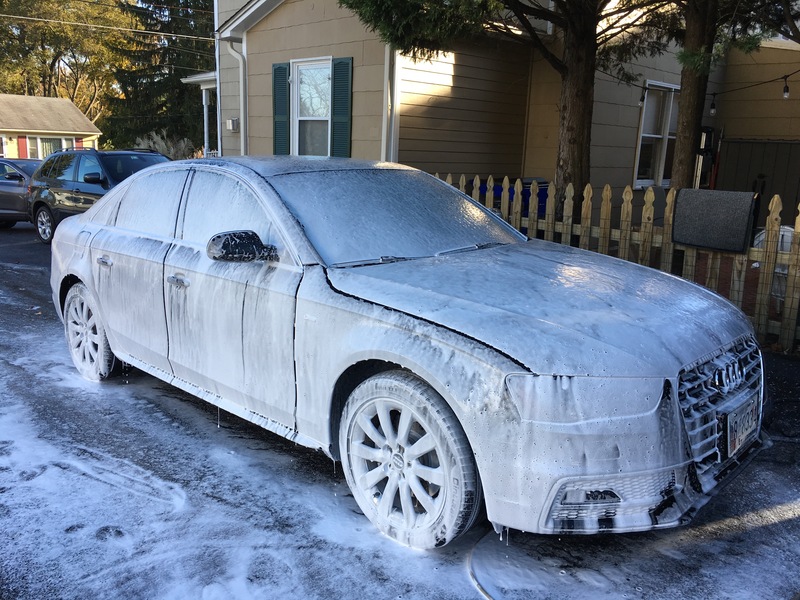 It had thick and snowy foam that provided good coverage and better dwell. Clearly a product that was better designed for this type of application. This is probably good enough for a maintenance wash without a wash mitt. Griot’s Surface Wash. Griot’s took a lot of criticism for being slow to get into the foam market, but this is generally held as the gold standard. 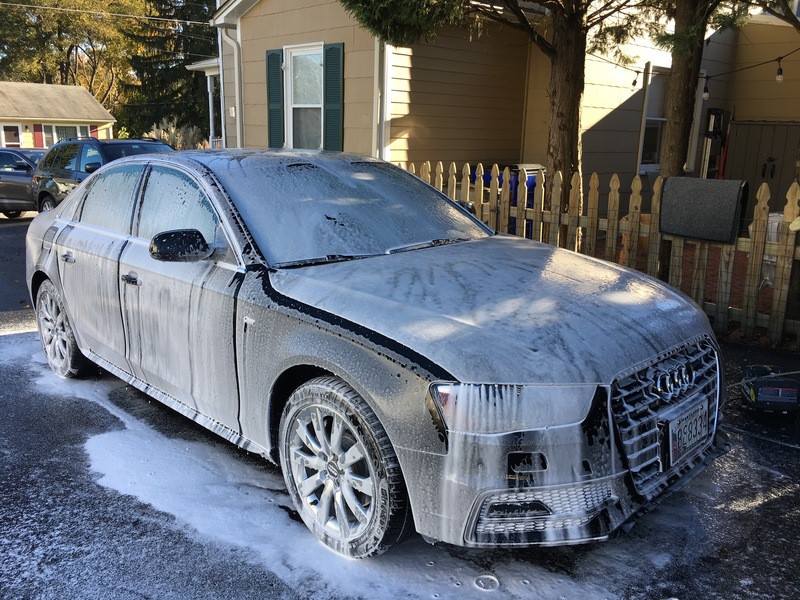 This was the clear winner when it came to foamy goodness and coverage. 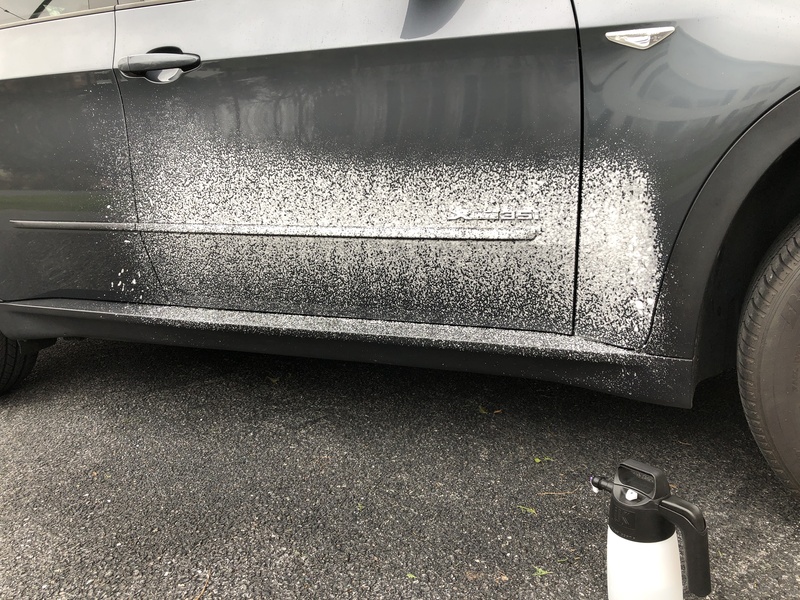 Since I had used it before, I knew how well it normally performed in the dwell test, but because it dissipated so quickly, that got me to thinking that the test wasn’t as relevant on an otherwise clean car, something that was further demonstrated with the last product tested below. For a really dirty car, this is the best choice. Finally: Griot’s Poly Gloss. 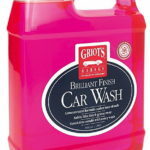 Griot’s intends for this product to be used after the Surface Wash, so you really need to buy both. Initial coverage was actually very similar to the much lower cost control. It does have a nice finish when dry, but not that different from using a hydrator or detailing spray while drying. I’ll have to do some more testing to see if this is really worth the extra cost compared to the other products. So what did I learn from all this? Griot’s Surface Wash makes the best foam and smells like a piña colada. I think it will be a good choice for really dirty cars and winter applications given the salty roads around here. The Poly Gloss was a bit of a disappointment. It smells better than the Brilliant Finish Car Wash, but really didn’t perform that much better to justify the added expense. 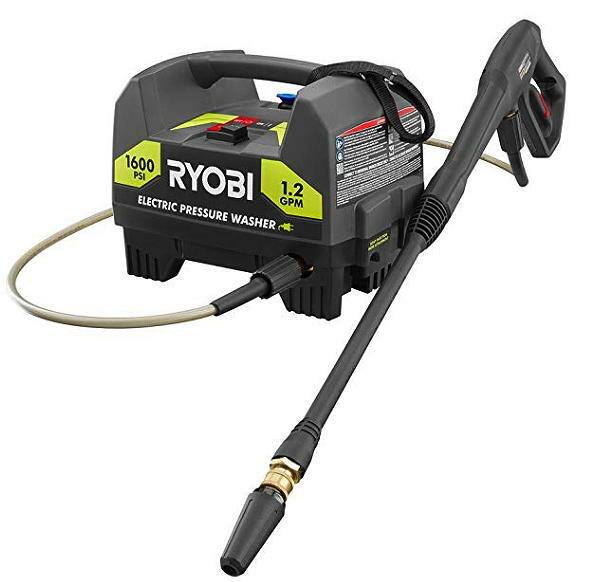 For this cannon and this pressure washer, I think Adam’s was the winner. I liked it so much I decided to buy some and was able to find a gallon on sale for less than $40. 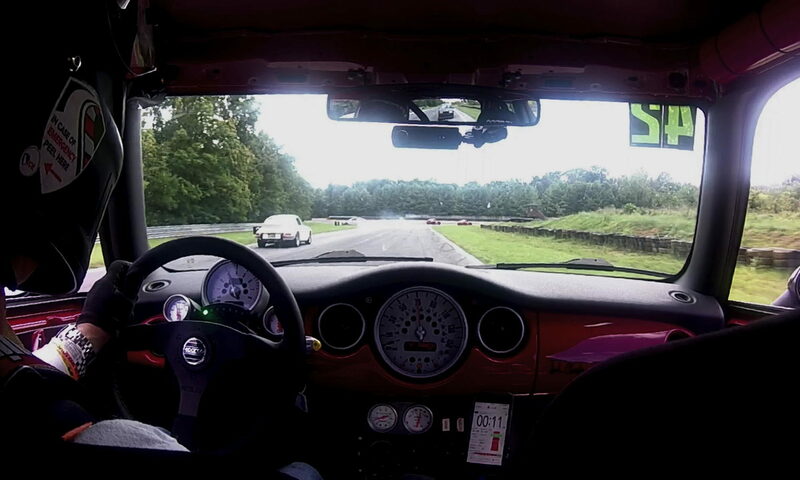 We started carrying Griot’s Garage products in the stop this month and as part of the dealer agreement, we have to be familiar with the full line of products. So dang, now we have to stay in the garage until everything is polished. I now completely understand why one of their kits is called “weekend garage therapy” – I’m a believer. Start with the book young Jedi: Once you admit you don’t know what you’re doing, read the Detailer’s Handbook cover-to-cover and you can start the journey of learning. Turns out I’ve been polishing, waxing, and buffing wrong all of these years, likely doing more damage than good. 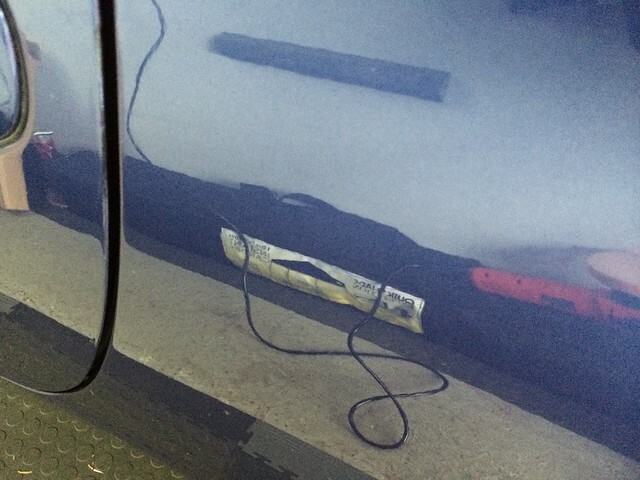 Fortunately the Porsche has a really thick layer of clear coat and quality paint. It’s hard to try to photograph before and after pictures of scratches in paint, but I think this one spot is a good example. This was a scratch on the driver’s side just past the driver’s door. Probably came from a parking lot. There was no ding or chip, but this mark would not come out even with a clay bar. 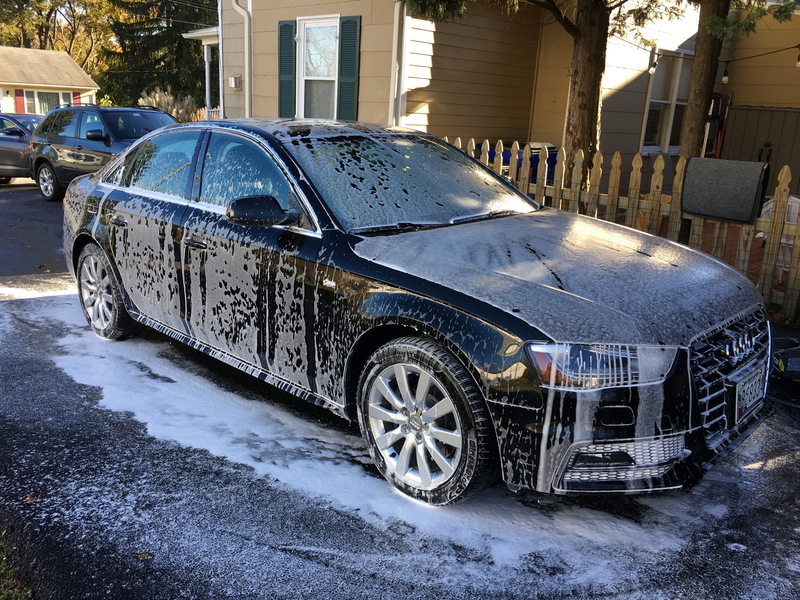 But just by following the right steps: wash, claybar, machine polish, and wax – it disappeared. I haven’t completed the whole side of the car yet, so right now there’s this one two-foot section that has a very deep shine surrounded by a rather dull, much larger field of blue. Ah something to do for the long weekend coming up!